New research from Public Health Ontario (PHO) and the Institute for Clinical Evaluative Sciences (ICES) suggests that whooping cough cases in Ontario are happening much more frequently than previously known, reinforcing the importance of up-to-date vaccinations to protect against illness and the spread of disease. Whooping cough (formally known as pertussis) is a highly contagious respiratory tract infection. In many people, it's characterized by a severe hacking cough followed by an sharp intake of breath that sounds like "whoop." Many people, though, don't develop the whoop; sometimes, a persistent hacking cough is the only sign that someone has the illness. In the case of infants, they may not cough at all; instead, they may struggle to breathe, or they may even temporarily stop breathing. Infants are most at risk for serious complications from whooping cough. Deaths associated with whooping cough are rare. When deaths do occur, however, they are most commonly seen among infants, especially those who are too young to be immunized against the disease. While whooping cough is required to be reported to public health in Ontario, a new study, published in the May 2 issue of PLOS ONE, suggests that the incidence of illness is significantly under-reported. The researchers compared and cross-referenced three different datasets in Ontario – public health reportable disease surveillance data, public health laboratory data, and OHIP data housed at ICES – and found that the estimated total number of cases among infants was almost double, from 545 recorded cases to an estimated 924 cases. The datasets include the period for 2009 to 2015. For those aged one year and older, estimated total of whooping cough cases was nearly eight times the number actually reported (12,883 estimated cases vs. 1,665 cases reported to public health). One of the main drivers of the under-reporting is the variability of physicians recognizing and reporting the illness to public health, note the researchers. "These numbers clearly show that whooping cough is much more prevalent in the community than we realized, making the risks of people catching and spreading the disease higher," notes Dr. Natasha Crowcroft, chief of applied immunization research and evaluation at PHO and lead author of the paper. "Whooping cough is a vaccine-preventable disease, and these research findings reinforce the need for people to make sure their immunizations are up-to-date to limit potential infection and spread. This is particularly important for people who care for or are in contact with young infants." Ensuring that immunizations are up-to-date are one way to control future outbreaks, says Dr. Crowcroft. 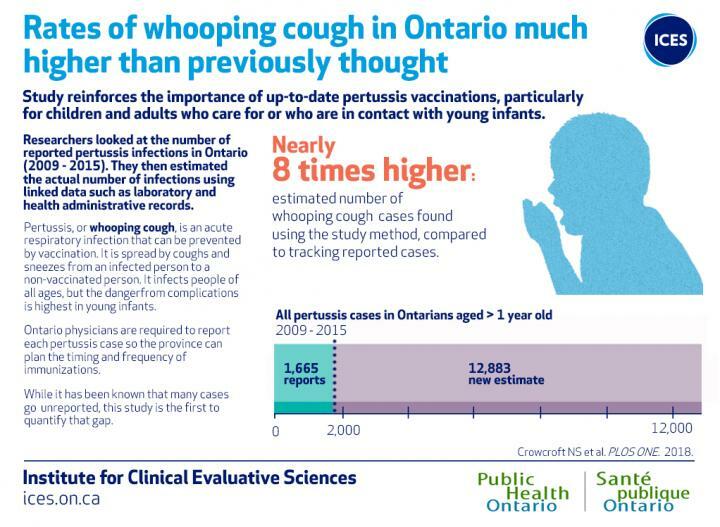 In addition, better surveillance data to capture the true incidence of whooping cough in the province can help enable evidence-based decisions when it comes to timing and frequency of immunizations. 12,883 estimated cases of whooping cough vs. 1,665 cases reported to public health from 2009 to 2015 in those aged one year and older. Nearly 80 per cent of hospitalizations are among children younger than five years old.